And then modify the BundleConfig.vb found in the App_Start folder in you project so that it references the jQuery.Migrate package. This should fix the problem until the templates get updated. 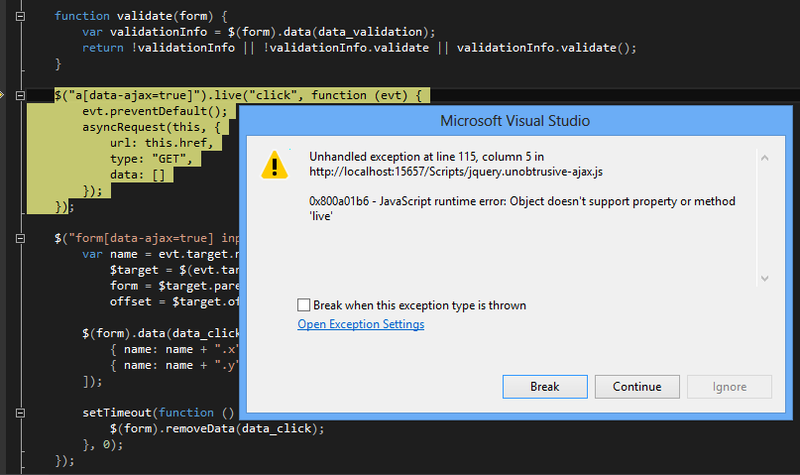 Error: Type 'Newtonsoft.Json.Linq.JToken' is a recursive collection data contract which is not supported. Consider modifying the definition of collection 'Newtonsoft.Json.Linq.JToken' to remove references to itself. Select the Reuse Types in Selected References option and tick all the boxes except the Newtonsoft.Json package. Spent last weekend and some of the start of my Xmas holiday trying to finalise the plumbing between my three tiers. There are now two types of services in the middle tier. OData read-only service. This is where things like the web client can get access to the game entities that get generated and allow for the game codex to be built. These will remain open and available to anyone that wants to view them. Updates and membership information. This will be a WCF based service mainly due to requiring the “Updates” to be sent over the service bus to the back end part of the system. And this is what will end up being secured at a later date when I’ve managed to research it more. The only part of the feed currently available is the Latest News feed which is shown on the front page of the client web site currently. There is also a hidden part of the client website which handles adding new news articles. The middle tier web service generates a GUID (Checking job result list in the DB to make sure it doesn’t already exists) and then creates a Service Bus “Job” which contains the GUID and passes GUID back to client. The back end tier receives the news article job and then adds the article to the database and writes an entry in the job result list saying that it successfully created or it failed to create the news article using the GUID as a key. While the back end is processing this job the web client has requested the job result from the middle service tier using the GUID key it recieved earlier. This service will wait up to thirty seconds for the job result to be generated (Checking every second) and then return the result back to the web client. It will also send a job to the back end to delete the job result. The upshot all this recent work on the plumbing side of things means that I can now proceed and create the more interesting bits of the game and hopefully make very few changes to the way the plumbing works. The heart of this system is the Job that passes from the Service Tier to the Back end Tier. All the code required to do a “Job of work” is held in these jobs. All the service tier has to do is create a job of a specific type and populate the required information, then send this job over the service bus to the back end. All the back end has to the is “Process” the job which makes the back end very small and simple in the way of code. All the work is done in the Job Process function. Hence most of the future development will be in these jobs and the client. Private Const CODEXURL As String = "https://tyranntrpg.org:8443/OData/Codex.svc"
Another weekend on hacking code to get the Tyrannt project off the ground. Again I am concentrating on the middle OData web service tier. One of the rules I set myself was to not allow this tier to update the database. These update requests are only meant to be done on the back end tier via messages passed along the Azure Service Bus (ASB). After an initial hiccup which resulted in my WCF service request falling over with “Not enough memory” (These are hosted in Azure extra small compute instances). I managed to get a working service in the cloud that exposed all my current tables. 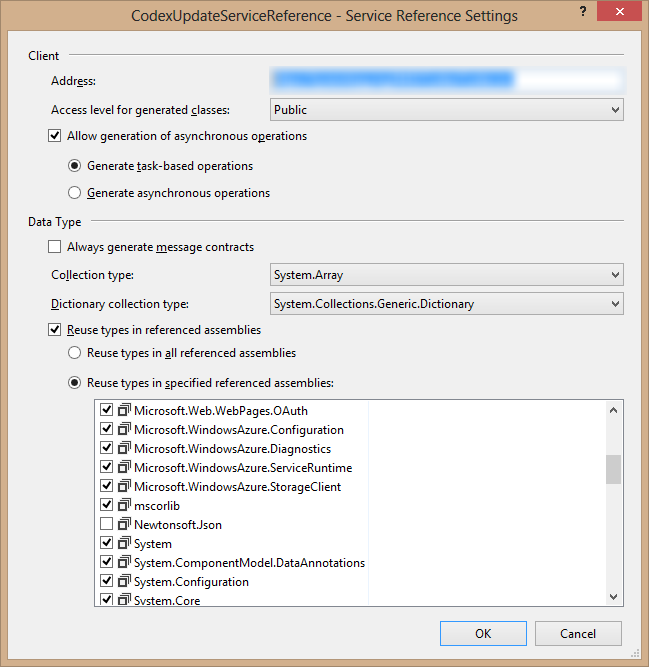 The model backing the 'TyranntSubsetContext' context has changed since the database was created. Anyway I still needed to expose different tables in different services. And as a nice surprise this time, it was very easy to do. I cannot guarantee this service will always work or still exist in future but it’ll be there while I test client side code. 'DataServiceProtocolVersion' is ambiguous in the namespace 'System.Data.Services.Common'. I removed the System.Data.Services.Client reference and Everything started working again. Just posting this in case I can help save some time for anyone else who is suffering from this issue.